I love dinner in a bowl. It's easy to serve, easy to eat and you can customize it to suit the tastes of everyone in your family. Last night I made a Greek style dinner in a bowl. It was so delicious that I thought I'd share my little concoction with you. Make your couscous according to the directions on the box. Once your broccoli, couscous and chicken are all ready, mix them together in a large pan. Add the olive oil and salt and lemon (if you like). Mix in the kalamata olives, or, put them in a bowl on the table and let people add to their bowl (I was the only one who had them in mine!). Serve and top with crumbled feta. It's good, it's filling and it's well rounded. What more can you ask for? Also, 2 people in my family preferred Parmesan cheese so you could sub the feta for that, or goat cheese. I was at a friends the other night and she introduced me to fig jelly. It was so so so oh so good. 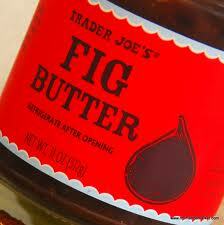 While at Trader Joe's, I found this-fig butter. Fig butter, goat cheese, crackers. HEAVENLY. If you need to bring something to a party, bring this combo. You'll be the talk of the town. Oh, and I've been craving for something greek lately! I have to try this although I don't think I'd find kalamata olives here.. but then again as you said this is very customizable!